Yesterday, I rode my first 2008 Time Trial Race against myself. Nearing the end of the longest climb of the day, old me started to suffer. So I got out of the saddle and made him really hurt. I used a tough hilly loop to the village of Chilly as my course (57 kilometres and 1100 metres vertical ascent). This is the 3rd time I have used this course to race myself – so I know that I am using an old route where I was working hard. 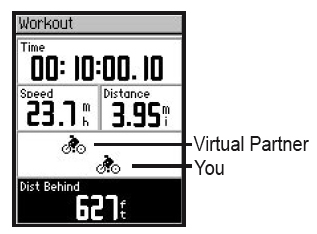 The first time I knocked 14 minutes off an old time, which shows how the virtual partner pushes me. The second, I knocked a couple of minutes off my time. The route starts off immediately uphill, which jars the system a little. And for an hour and a half, I stayed within a few hundred metres of my September 2007 competition. There was no time for relaxation or photos. This was a close race – me and old Will were evenly matched. It is surprisingly motivating watching the little GPS screen and not wanting to lose to my younger, cocky self. But nearing the end of the longest climb of the day, old me started to suffer. So I got out of the saddle and made him really hurt. I am the world’s slowest descender, but today I flew down the final stretch – ultimately sailing home to a small victory – wooohooo! I’ve been having a bit of trouble with my asthma recently – and am trying some new medication – so I was pretty pleased with the result today. That’s more like it. Now throw some intervals AND rest in, and you’ll soon be whipping that young whipper-snapper’s arse. That’s awesome… now you really have me thinking about a Garmin Edge 305. Congrats… sometimes the small victories matter most. Way to go Will – but take it easy… you only want to peak in July! Pollution has been bad as of late and may be contributing to your asthma – if only more people cycled!